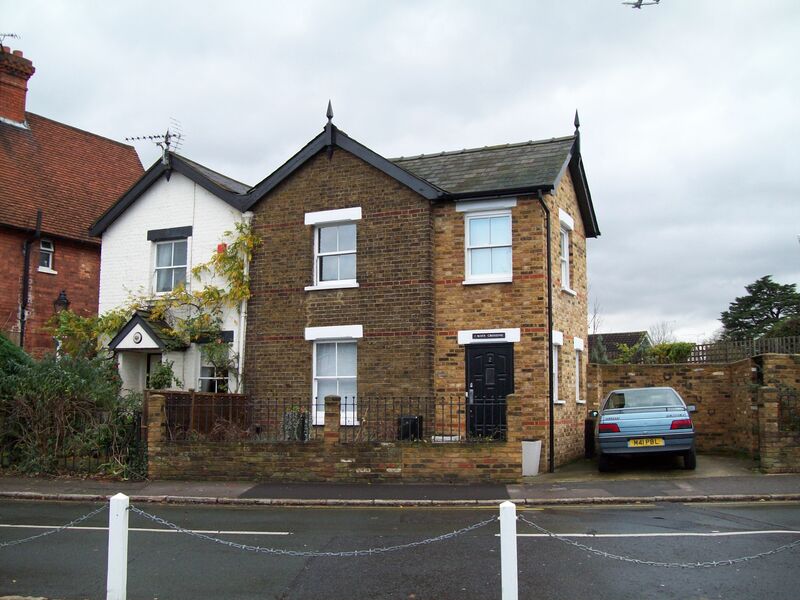 These two cottages were built by the South Western Railway Company in the early 1860s. They were listed in the 1866 property rating survey for Bucks but had not been there at the 1861 census. Number 2 (on the right) has been considerably extended in recent years. This level crossing and the cottages are said to have been called ‘Mays Crossing’ after a signalman or gatekeeper who was killed in a railway accident. This seems to have been half true, in that William May and his family did live in number 1, listed there in 1866 and in the 1871 census when he was aged 61 and his occupation was given as a railway porter. His son William was 23 and unemployed, the second son Albert was also a railway employee and the youngest, Thomas, was at school. The family was not local and had frequently moved around, probably following available work. By 1881 the family was living in Green Lane. William was still a railway porter, aged 71, and the only son still at home was William, age 33 and working as a labourer. Although they were no longer living at the cottage William May was still in the same occupation, but by the 1891 census he was receiving a railway pension and living in Horton with his wife and son William; so he does not seem to have been killed on the railway as the story suggests. (It is possible that Albert, also working for the SWR, was the one involved in an accident but there is no local death record for him.) William May the elder lived until 1893 when he was aged 83. I understand that my great great granddad was the crossing keeper here for many years, and that the crossing was named after him. I have found an old letter written by my grandmother saying that he used to open the gates for Queen Victoria when she drove to Windsor, and that the Queen made him comforts in the winter (but I am not sure what comforts are). This seems entirely plausible, since the old Back Lane was renamed Queens Road in honour of the Queen who used that crossing in preference to the one in the High Street, as the royal family often still does. It seems he was a gatekeeper, which may have been a promotion as he grew older. ‘Comforts’ probably means small personal items such as scarves, or perhaps tobacco, and it was the custom for presents to be distributed to all royal servants according to their social and employment status. However, it is not possible, as is sometimes said, that the level crossing was made for Queen Victoria’s use, because the lane had existed for centuries before the railway carved through it in 1848 as well as through the High Street, requiring the two level crossings that have been a problem ever since. Looking towards Mays Crossing in about 1950, cottage number 2 is partly seen, with the gates and the gatekeeper’s or signalman’s box.